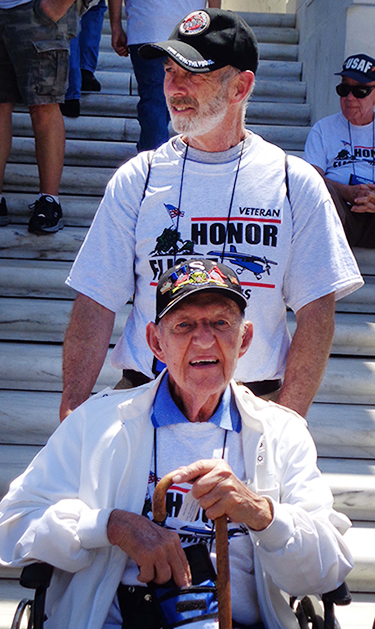 Veterans Cy Stickel and Harold “Butch” O’Brian at Washington, D.C. Both are Picway Plant retirees. Two former co-workers from AEP’s retired Picway Plant spent a day of honor and celebration along with 85 other senior veterans. Cy Stickel and Harold “Butch” O’Brian were on the June 10 Honor Flight to Washington, D.C. to visit the memorials dedicated to the men and women who served in America’s armed forces. Stickel served in the U.S. Army in Europe during World War II. He served as a medic, driver, company clerk and infantryman from March 1943 to January 1, 1946. O’Brian served as a U.S. Marine Corps rifleman in Vietnam in 1969 and 1970. Both are AEP retirees. Stickel worked at Picway Plant, in Lockbourne, Ohio, from 1946 to 1984 as a shift supervisor. O’Brian was plant manager at Picway from 1986 to 1991 and held several Generation Engineering positions until his retirement in 2010. O’Brian is also a volunteer at Honor Flight Columbus. He has helped in a number of ways including being a guardian on earlier flights, accompanying senior veterans. The Vietnam Veterans Memorial Wall in Washington has more than 58,000 names of men and women who died in that war. Stickel enjoyed his visit to the World War II Memorial, which opened in 2004. It pays tribute to those who have been called “The Greatest Generation” and won the war to protect democracy in America and across much of Europe. “Having strangers come up and shake my hand, even giving little hugs while thanking me is a feeling that cannot be described,” Stickel said. Honor Flight Columbus provides one-day trips to central Ohio’s senior veterans at no cost to the veteran. The June 10 flight was the 82nd trip made by the organization. Nearly 5,000 veterans of World War II, the Korean War and the Vietnam War have been on this trip of honor and celebration.